Good God, it's almost July. A few days ago it was, like, March or something. Summer, for me, is about getting through the heat. Not the sunniest outlook, perhaps, but mostly true. For my wife, summer is about going to farms on weekends that we're free enough to do so...and which actually hasn't happened yet. And when I can be dragged there, I actually do have fun. But summer is also about projects. I almost always have an RPG gig going in the summer months. Two years ago it was the Dungeon Crawl Classic campaign world of Áereth. That was a big one. Last year it was for the Castle Whiterock boxed set. This summer, as I wait for my book edits, I'll be doing a bit of writing for something else not unrelated. Oh, and one more thing summer means: getting ready for GenCon. With each year, there's more people I look forward to meeting, and friends I don't get to see but once per year there. Fellow author Marcy Rockwell even helped set up some book signing this year (WotC didn't do it, so authors took it into their own hands to get this going), so I'll get to join her, Keith Baker, and Tim Waggoner in that humble endeavor. I'm a lucky guy. There are a lot of things I wish I could change about my life——most involving finances——but I've got some really good things going. 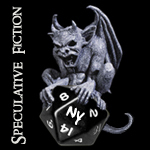 I have an awesome wife, I get to write fantasy novels (2 so far, I hope for more), and now I'm starting to have various writing gigs to choose from at any given time. That's very cool, and I owe thanks to a lot of people for these opportunities. Harley, if you're out there: Goblin Tails was one of my first publications. Thanks. And hey, can we do anything to get that out there again!? I'll promote it up the wazoo. Saturday, June 21st, is Free RPG Day. Go get free stuff at a participating store! Free stuff, people! 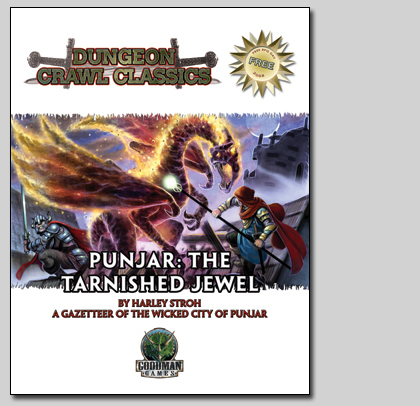 My very small part of it was a contribution to this day was a wee bit of writing for Goodman Games's Punjar: The Tarnished Jewel, an all-fluff gazetteer detailing one of the DCC campaign world's most notorious cities. There is a lot going on right now that I could easily cave in no and complain about. But there's too many worse things in the world that don't give me the right. So I'd rather talk about the good things. 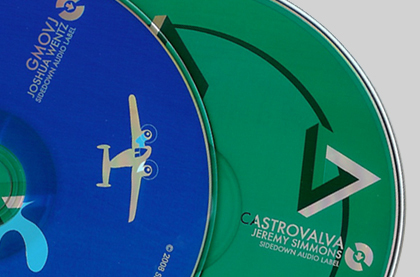 Castrovalva, by musician/writer/cartographer Jeremy Simmons, a collection of acoustic/folky guitar songs that I really, really liked from when he first shared some of them with me a couple years ago now. This album maintains a constant presence in my iTunes list and gets a lot of circulation in my iPod. GMOVJ, by musician/designer Joshua Wentz, a mix of moody and introspective songs ideal for driving in the rain. At least that's where my copy is going: straight to my car. (Well, after the mp3s get queued up.) The album is a kind of homage to Josh's favorite musician, Mike Oldfield. And if you don't know who that is, you might be doing something wrong in your life. In which case, let me know and I'll fix it! Both albums go for $9. That's cheaper than any full album on iTunes and you get a physical and very slick-looking disk. I highly recommend them. These guys are both good friends of mine, but I can honestly tell you that the music is solid, enjoyable, and worth having. As a gargoyle, I spend a lot of time out in the weather. At this time of year, it means I'm the first to get a good bearing on the summer...and summer sure came early. A bit too early. Let me tell you, people, it's goddamn hot out there! Now I've got tough skin. I can weather the sun. I am the Weather Gargoyle, after all. But in this sort of heat, in the big city, it's more than just direct rays of sun hitting you. See, here in the city that sunlight soaks into the concrete and radiates back up, reflects off all those pretty shiny windows you architects are so proud of. It's pure torture for someone like me, who's basically caught between a fiery orb of incandescent gas about 93 million miles away and the sizzling streets of Manhattan. And I've got a sensitive nose. Every day in New York it's garbage day somewhere among the avenues and boroughs. As much as I like the aromas rising up from Little Italy and even China Town (I do love Italian food best), I don't care much for the broiled reek of garbage and sewer drains. Manhattan becomes a vast buffet of refuse that you don't even want to KNOW about. But someone's got to be up here, perching on buildings, doing this job. Still, let up on the heat, eh? Let's say when you were young you gave into peer pressure and started chewing on some sort of gum which made your teeth black. But it was cool, having black teeth, and being seen chewing it. Then, later in life when you're no longer even around your peers, you keep at it anyway, just because you always did, despite the fact that the gum was always expensive. Meanwhile, your family finds it repulsive, and asks you many times to stop chewing it. But you don't. You're the man, you call the shots, they don't know what they're talking about. Years down the line a doctor actually tells you the gum is doing damage to you, and that's why you keep getting bad headaches. The black teeth is no big deal, but you're head is hurting because of it. But good news: the doctor says says that if you stop now, you can actually recover from its effects. But you don't, because you're You, and the world revolves around you after all, doesn't it? A few more years go by, and your family keeps asking you to stop chewing this life-killing gum. But who are they? They're not you. So you keep at it. And then you get sick, real sick from it. And it turns out you'll get splitting headaches for the rest of your life now, and it will effect everything you do. Life will be experienced from now on through a lens of pain. But hey, guess what? You stop chewing that gum. Good for you. But the pain goes on. It goes on and you actually have to buy a machine that helps minimize those head pains. Only it's not you who has to deal with the paperwork of getting that expensive machine and maintaining it from there on. It's your daughter who does. Well, why not? She's just a girl. It's not like she's a man. That would be different. For some reason you don't understand. So you suffer, and you complain...endlessly you complain about those headaches and you make life more difficult for those who used to plead for you to stop chewing that gum. Your condition worsens, steadily. And over time the machine alone doesn't suffice. You need to go to the hospital periodically to try and relieve those agonizing head pains. Who takes you there? Your daughter. It doesn't matter that she's married now or tries in vain to pursue a life of her own. What matters is that you're suffering, and if you complain about it enough, she takes you to the doctor to deal with it. And then you didn't have to do the asking, either. Asking would be too much. Asking anyone for help is a breach of your pride. And your pride is, for some reason, very important to you. There's only one moral here: take some responsibility for your actions. And try to take care of yourself. If you can't, someone else will have to, and you will impose your life on theirs and they will suffer for it. Sometimes life throws things at you, things you didn't ask for, things you did everything to prevent, but it still does. But the things that you brought upon yourself? Deal with them yourself. It isn't fair to ruin someone else. You may not be doing anything now that's hurting you. But look forward in time. In 10 years, 20 years, 30 or more...who will be dealing with this crap when you're no longer able to? The aforementioned Josh Wentz has just released an EP (short album) called Field as part of the new label Sidedown Audio. You can buy it over on the website INDISTR for super cheap. 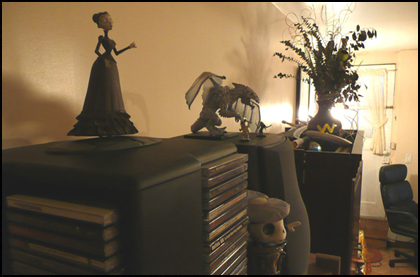 It's a neat set-up, actually. You can buy each song for one buck†...OR the whole EP (4 songs) for any price you want, between $1 or $20 and you can use PayPal. Consider it! It's mellow and even a little jazzy, good rainy Josh music that I've come to enjoy, but there are some things that set it apart: one of which is some zany lyrics! Given that I like dramatic introspection in my music and lyrics, I'm particularly fond of "Elements." Get it! For a dollar if you must! Read more about the EP here. Also...Sidedown has just released HEY Quarterly volume 2, issue 2, which is called HEY Junction and features cool art and interviews (even with me). It's twelve bucks† and all proceeds go to the Anti-Cruelty Society. Read more about it here. † "Meaning of 'dollar' is 1856, American English, perhaps an abbreviation of buckskin, a unit of trade among Indians and Europeans in frontier days, attested in this sense from 1748." Ashlock.org friend Josh Wentz has been listed as an INDISTR Insider Pick over ultimateears.com. You should check it, and the corresponding music links, out here! That page provides a short bio of Josh. Just for fun, I've decided to list it here, as it would appear if it were translated into French, then to German, then back into English over at Babel Fish. Life is too short not have fun with these things. 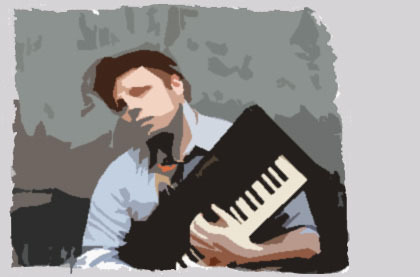 Joshua Wentz is a typesetter and interpreter of multi instrumentalists in Chicago, Illinois. During the twelve last years he has on a complete lack at entrance hall creating and independently the freeing from 4 albums and 10 EPs, which write the developing music for the documentary film and commercial applications experiment to distance co-operation and completion of his studio at the house begins concentrated, recently meetings of Winchester, a weekly Podcast of the improvised long and collections. Joshua Wentz's music is kind-agnostic to move, which selects, in and outside that rather well-known models, as, which remains planted in specific categories. His newest integrals release, GMOVJ, is an homage at Mike Oldfield, an estimated artist, who had a deep effect on his career. Its newest EP, with the designation Field, is set a place, which is dedicated to the work of the independent artists exclusively for a release from June on INSDISTR (www.indistr.com). He is conscious itself that independence in the music can often cover a fight for the design and marketing, Joshua Wentz has based Acoustics of Sidedown, a label for the artists Solos house collection, which in June 2008 is started. "My reason is in the conception and wanted a label to create, which combines the amazing music with the quality conception, in order to create an artistic and professional product, everything, by it maintaining artists fully right at their music." Acoustics of Sidedown will release those between 4 and 6 albums per year, with Joshua Wentz begins with GMOVJ and Castrovalva moving and acoustic breeding album by Jeremy a Simmons.